As a full time vendor during the cooler months, I've been preparing non-stop, all year long, for the fast approaching holiday season. When it was 100 degrees outside, I was still crocheting winter hats like a crazy person. 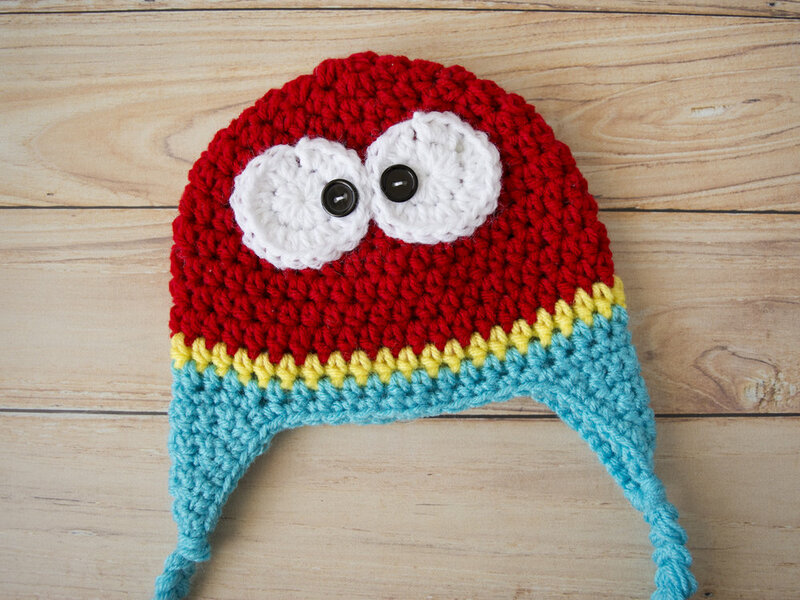 The most popular product I sell as a vendor are children's hats, which suits me well because I LOVE making them! There's just something special about designing a variety of hats that put smiles on peoples faces. With that in mind, I've decided to dive into my bold, colored yarn stash and create a free pattern to share with you guys. I hope you enjoy! Sl st into next st, tie off. Switch to yellow yarn. Sl st into next st, tie off. Switch to blue yarn. Sc evenly, all the way around the hat. Fasten off. Weave in ends. Sc evenly, all the way around the hat. Tie off. Weave in ends. Sew buttons onto eyes and wip st eyes to body (see pattern pointers). Sl st into next st and tie off leaving a tail. Wip st beak to body (see pattern pointers). Sl st into the bottom ch of the first row, tie off leaving a tail. Wip st hair feathers to body (see pattern pointers). Using blue yarn. Cut 16 strands of yarn 28" each, separate 8 strands for each earflap. Attach to bottom of earflap and braid (see pattern pointers). This is what the base of the hat should look like. You may have more or less rounds depending on what size is being made. For this example, I am using the 6 month size. This is what the earflaps should look like. 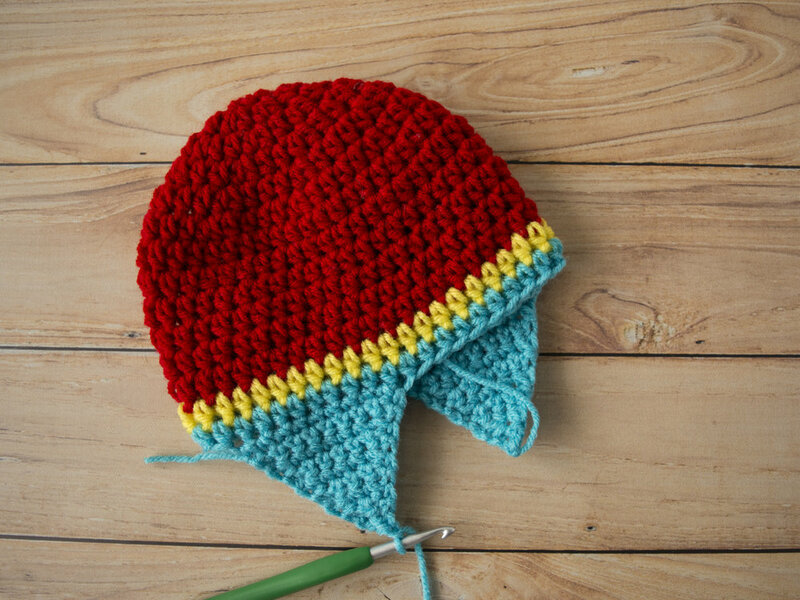 Do not tie off after creating the second earflap. Sc evenly, all the way around the hat. Tie off. Weave in ends. Fold 8 strands in half, loop and attach to bottom of earflaps. Splitting the strands into three equal parts, braid. This is what the embellishments should look like. This is what the eyes should look like. Sew buttons on with thread or yarn. If the hat is for a baby, you could sew a small black circle instead. 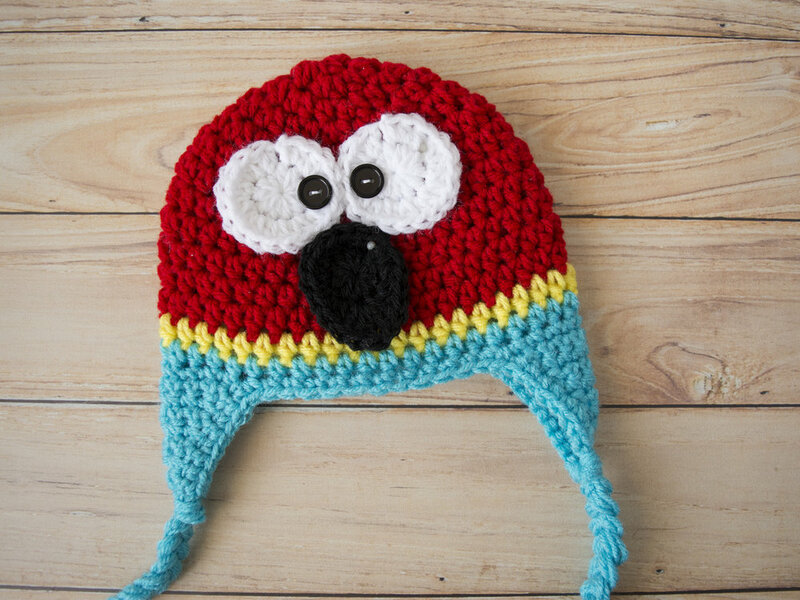 Sew eyes in the center of the hat and a little more towards the top so theres plenty of room for the beak. Sew the beak right under the eyes so the top of the beak is resting against the bottom of the eyes. Sew the feather appliqué on the very top of the hat.